If you are going to sew, the chances are you will need to purchase a good quality pair of sewing scissors before you get started. I suppose that you could pay someone to cut everything for you. That is a viable option. However, it is not an option that I encourage or endorse. Good sewing scissors will cost you far less in the long term. This post will focus entirely on scissors. There are a variety of other cutting products available on the market, however, to start garment or other utility sewing you will need a good pair of scissors. There will be additional posts about these additional sewing options in the near future. A long standing brand in the cutting industry that offers a wide range of scissors and cutting implements – Fiskars. Fiskars offers a wide variety of scissors and other cutting implements for any level of sewer. More advanced sewers might shy away from the Fiskars brand but there are a lot of options available to the higher end skill set. However, the beginner sewer should not feel pressured or bullied into buying more scissors than are truly necessary for basic sewing skills. The truth be told, I still have the pair of Fiskars sewing scissors that my mother bought me in Junior High School for my Home Economics Class I took. Yes, I still have them roughly 30 years later. They are not as sharp as they once were, but they are still in my sewing scissors drawer and I still pull them out from time to time. The orange handles are a reminder of the period where I learned to sew on actual projects. It is my understanding that the warranty on your Fiskars brand scissors is outstanding. I personally have not had to submit a warranty claim on these scissors in the 30+ years I have had them. They could use a good sharpening at this point, but you are buying a long lasting product. A brand that has had longevity in the cutting industry as a producer of quality sewing scissors – Gingher. Gingher scissors are the ones you buy for life. Do not let the name on these “dress maker shears” fool you, they offer a nice universal use case. They feature “precision ground, knife edge blades” that allow you to easily cut through multiple layers of fabric. While they do maintain their sharp cutting edge for a very long time, these scissors can be sharpened under warranty. Visit the Gingher website for additional warranty details. You can purchase your Gingher scissors in the left-handed variety. No stress. No mess. Perfect cuts every time. This is not to say that other brands do not also produce true left-handed sewing scissors. Please check availability on your choice of scissors. A popular brand that is known for sharp cutting edges at budget prices – Westcott. Some materials are extremely hard on scissors. Some materials dull the blades of your scissors very quickly. Never cut paper with your sewing scissors. However, Westcott brand scissors offer quality scissors that can handle these jobs without regrets or worry. Due to the price of these scissors when on sale, these scissors are perfect for those projects that might be a little rough on your scissors. Cutting fleece (any amount) or flannel (in large amounts) comes to mind. Affordable, but durable. The Westcott Scissors I picked up at Staples one year worked wonderfully for fleece. No regrets with that purchase. While they are not what I would consider fabric cutting worthy at this point, they still cut paper perfectly fine. I should look into simply getting these sharpened and see if I can bring them back to their original glory. While you are sewing, you will need to clip threads as you go. While you can use your traditional full-sized sewing scissors, you will be able to clip those threads closer to the fabric surface with a smaller finer blade scissors. Embroidery scissors are perfect for this use case. They are intended to get close to the surface. These little handy scissors are intended for detail work. You need a fine sharp blade with a sharp tip to get those threads trimmed as close as possible. Common among a lot of machine embroiderers are curved tipped scissors. These little scissors fit the bill nicely. The choice of scissors is similar to shoes. Not one size fits all. If you have smaller hands, smaller sewing scissors may be more ideal. The same if you have larger hands. I do recommend that you have at least 1 pair of true sewing scissors with the bent handle. That will save you some hand and wrist fatigue. I also recommend that you have at least 1 pair of smaller scissors for snipping threads. Keep these by your sewing machine and handy. If you have arthritis or other hand related weaknesses (or handicaps) please remember that there are scissors out there for you as well. Fiskars is a popular maker of the easy grip, adjustable tension scissors. Head to your local sewing store and try out a few and select what is most comfortable to you. 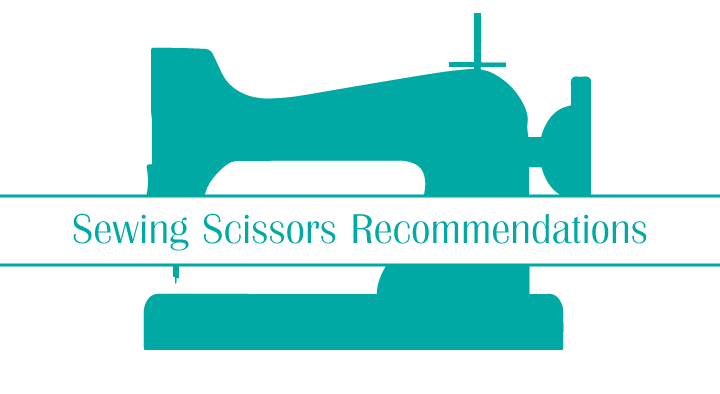 What sewing scissors do you use? What do you like about them? Follow us on Instagram for behind the scenes sneak peeks of current projects, sales, and new product releases. Sign up for our newsletter at the bottom of the screen. Your information will not be sold in any way. You will only receive an email every 1-3 months. These email newsletters will contain a discount code only available to newsletter subscribers.